Interesting history behind the research for re-entry vehicles. 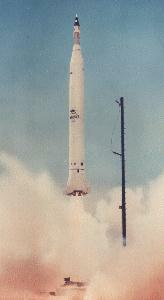 In 1955 Britain was designing its first ICBM, to test the re-entry they needed high altitude/high speed. They performed these tests using the Woomera test range in Australia. This range was run by the Australian Weapons Research Establishment (WRE). During the re-entry tests of the British Military's Black Knight flights, an unexpected phenomenon appeared. The glowing gas trail showed up on the WRE's radar. The US was very much interested in this. They joined the tests. In 1966 they sent to Australia, 10-Redstone missiles. The US had to pull these from retirement and borrow the launcher from the Smithsonian Museum. This phase was called SPARTA (Special Anti-missile Research Tests, Australia). Two solid booster upper stages were created for these tests. A total of 9-test flights were done. Flights were flown at night to an altitude of 200 miles [320km] using the Redstone booster. During the coast phase, the velocity package was flipped to send the payload back to the atmosphere. At apogee, the upper stages were ignited sending the payload back to Earth at 20,000 feet per second (over 13,000 mph [6,100M/sec]). Early success with these SPARTA tests, the last Redstone wouldn't be needed. Instead of sending back to the US as scrap, it was given to the Australian's to launch a satellite. The WRESAT would carry tests to help continue the study of the Solar-atmospheric interactions. 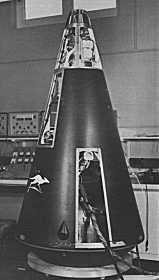 On Nov. 28, 1967 it was ready for launch, however an air-conditioning unit failed to dislodge from the side of the rocket. A second attempt was made the next day. At 2:19PM, Nov. 29, 1967 the Redstone/WRESAT lifted off. After two minutes the booster shutdown, separated, allowing the upper stage coast up to 180 miles [288km] above the Earth. During this coast phase the upper stages were aligned parallel to the planet. Small rocket motors spun up the upper stages and the second stage fired for 30-seconds, then the 3rd stage fired for 9-seconds. These burns accelerated WRESAT to 18,000mph [29,000km/h]. Australia's first satellite with a white Kangaroo emblem was in orbit. It re-entered the Earth's atmosphere on Jan 10, 1968. Wresat was Australia's first satellite, it was also the last Australian built, Australian launched satellite. Proving Australia's technical competence in space. Once again Peter Alway's book Rockets Of the World supplied the drawing dimensions and history of this very interesting project. Great book for drawings and reference material! Attached is a PDF file of a 1:32 Scale WRESAT stomp rocket. Thanks for the interesting history. It's sad that Australia has had very little direct involvement in space technology. Mike, I can't thank you enough for this model. Also, thank you to America for the gift of the launch vehicle. It allowed Australia to be the fourth country to launch a satellite into orbit from their own soil. Here is a site with some videos of the preparation and launch. I always get a giggle out of the satellite being bounced around in the back of a truck prior to it being attached to the launch vehicle. Very interesting history, main reason why I wanted to do a stomp rocket version. Very interesting history behind many rockets, have a whole list of models I want to create. Using Peter's book, simple to do as he gives stationing and diameters. Problem is need additional research to find drawings with small details like panel lines and rivets.